From earliest times Gaelic Ireland and Scotland, united by the sea, formed part of the same cultural, linguistic, religious, economic and political ethos. The cultural and linguistic homogeneity, together with the political instability of this North Channel World, alarmed central government. For the monarchs and their ministers—whether in Dublin, Edinburgh or London—regarded the economic, political and cultural distinctiveness of its inhabitants as ‘uncivilised’ and potentially corrosive to the English and Scots-speaking polities. They classified them as barbarians, rebels, and subversives intent on de-stabilising the peripheries of the Tudor and Stewart monarchies. Yet prior to the union of the crowns in 1603, Elizabeth I of England and James VI of Scotland manipulated the very instability of these outlying regions, especially Ulster, to their own ends. However with the accession of James VI to the English throne in 1603 priorities changed and the king became determined to drive a wedge within Gaeldom, to pacify, and to ‘civilise’ it. James genuinely hoped to unite his three kingdoms ‘under one imperial crown’ and to give his peoples the freedom ‘to commerce and match together, that so they may grow into one nation’. To this end legislation, passed by the Irish parliament in the mid-sixteenth century ‘against bringing in of Scots, retaining of them, and marrying with them’, was repealed. Many in Ireland welcomed this initiative and one member of the Irish House of Commons argued ‘that both English, Irish, and Scots, living under one God and one king, should be equally capable of preferment’. Despite this rhetoric contemporaries from the king down continued to regard the Gaelic Irish and, to a lesser extent, the Highlanders, both mentally and culturally as a lower form of humanity. They were savages and barbarians who had failed to progress, to farm for their food, and to inhabit an ordered polity regulated by the law and Christian morality. Early in the seventeenth century Sir Arthur Chichester, Lord Deputy of Ireland, described the Gaelic-speaking inhabitants of the Scottish Highlands and Islands as ‘a proud, obstinate, and disobedient people’, as ‘a barbarous, irreligious, and headstrong people, inured to crimes and spoils’; while Ireland was, in his opinion, ‘that barbarous land where the people know not God, nor care not for man’. Convictions of racial superiority critically shaped attitudes about how best these remote regions could be ‘civilised’—how these unruly subjects could be reformed, their overmighty lords tamed, thuggery and feuding replaced with law and order, and labour channelled into production rather than destruction. Crown strategies ranged from annihilation to assimilation. The militarised nature of the North Channel World often forced the sovereign to resort to arms. During the later decades of the sixteenth century a number of costly English campaigns—culminating in the Nine Years’ War (1594-1603)—completed the military conquest of Ulster and resulted in the exodus of thousands of Irish swordsmen to the continental theatre of war. In Scotland James VI launched five ‘fire and sword’ expeditions along the western seaboard between 1596 and 1608, expropriating where possible lands belonging to the insubordinate MacGregors, MacLeods, MacIains and MacDonnells. Ultimately, inadequate financial and human resources, ensured that central government generally favoured reforming initiatives which promoted the maintenance of law and order by attacking the military systems which underpinned lordship and clanship. The need both to tame overmighty lords and to win the tacit co-operation of key members of the local elite was also central to any reform programme. Along the western seaboard, James VI, like his predecessors, skilfully twisted traditional, Scottish baronial rivalries to his own advantage. In the Western Isles royal power rested predominately with the Campbells, Earls of Argyll, who, in the wake of the collapse of the Lordship of the Isles after 1493, acquired vast estates stretching from Kintyre through the central Highlands to Cawdor in the north-east. The Campbells acted as an effective—albeit self-interested—bulwark against the rebellious Clan Donald South. However the MacDonnells, now operating from a power base in Ulster, made repeated attempts throughout the seventeenth century to regain their Scottish patrimony and to strengthen their position especially in Kintyre and Jura. In retaliation Argyll accused Clan Donald of ‘being the strongest pillar of all the broken highland men, who never in any age were civil, but have been the school masters and fosterers of all barbarity, savageness, and cruelty’. He continued that they ‘have ever…been addicted not only to rebellion within this…land and the isles, but ever were assisters of the northern Irish people, dwelling in Ireland, in all their rebellions’. The Scottish Privy Council agreed and maintained that until Clan Donald had been rooted out and this link with Ireland broken ‘his Majesty nor any others shall have any profit, and the incivility and barbarity shall continue not only [in Ireland] but in the Isles’. The MacDonnells of Antrim fought back. In 1627 Randal MacDonnell, first Earl of Antrim, offered to purchase lands in Islay; while in 1635 he almost managed to buy Kintyre and Jura until Lord Lorne, who succeeded his father as eighth Earl of Argyll in 1638, frustrated the bargain. Lorne, claimed that Antrim’s initiative would ‘make the people turn papists’ and de-stabilise the political status quo. Despite this setback, his son the second Earl of Antrim made further attempts to recover his ancestral lands. As his reward for supporting Charles I during the Scottish Bishops’ Wars (1638-1640) and the ensuing Wars of the Three Kingdoms (see below), he requested the return of ‘whatsoever land he can conquer from them [the Campbells], he, having pretense of right, he shall have the same’. In addition to playing off the Campbells off against the MacDonalds/MacDonnells, James VI also sought to make local lords directly responsible for the actions of their kin. The Statutes of Iona (1609), brokered by Andrew Knox, Bishop of the Isles, aimed to make the Highland chieftains agents of ‘civilisation’ by requiring them to obey the king and to observe the laws and acts of the Scottish parliament. More importantly the Statutes, ‘imbued with the cultural values of the Lowlands…commenced a sustained legislative offensive to modify, if not terminate, the disruptive aspects of clanship’. Clauses such as those restricting the consumption of and access to alcohol, or controlling the size of a lord’s household, aimed to undermine the culture of ‘feasting’. Others sought to demilitarise the clans by ridding them of the fighting men—buannachan—and outlawing the exaction of tribute. The administration in Edinburgh also held that ‘the Irish [Gaelic] language…is one of the chief and principal causes of the continuance of barbarity and incivility amongst the inhabitants of the Isles and Highlands’. Thus the Statutes of Iona called for all gentlemen to educate their eldest son in Lowland schools so that they ‘may be found able sufficiently to speak, read and write English’; while further legislation (1611) made attempts—albeit unsuccessful—to abolish Gaelic altogether. Similarly in Ireland the government set out to weaken the military powerbases and to ‘anglicise’ Irish lords. During the later sixteenth century a revitalisation of central and provincial government occurred which facilitated the piecemeal reintroduction of English law—the critical prerequisite to the ‘civilisation’ of Ireland. An act of 1537 aimed to introduce ‘a conformity, concordance, and familiarity in language, tongue, in manners, order and apparel’ and to cast aside ‘the diversity that is betwixt them [the English and Irish] in tongue, language, order and habit’. To this end, many advocated the establishment of parochial and grammar schools, thereby ensuring, as legal imperialist Sir John Davies put it, ‘that the next generation will in tongue and heart, and every way else, become English; so that there will be no difference or distinction, but the Irish sea betwixt us’. Closely linked to this drive to expose the young to the English language and English culture, came the desire to wean them from the subversiveness of Popery and by the mid-sixteenth century Protestantism had became a further, key index of ‘civilisation’. In Ireland inadequate financial and human resources, the vibrancy of the Counter-Reformation, combined with the reluctance of the Catholic elite to conform, hampered the spread of Protestantism. Yet on both sides of the North Channel, Protestant clergymen increasingly spearheaded imperial initiatives. Lord Deputy Wentworth’s unpopular patriarch, John Bramhall, Bishop of Derry, behaved as an ‘episcopal ogre’ as he enforced canonical norms and recovered ecclesiastical patrimony in a bid to ‘anglicise’ the Church of Ireland. Similarly in Scotland, Andrew Knox, Bishop of the Isles, who had played a central role in tackling problems in the Highlands and Islands, was sent by James VI and I, as Bishop of Raphoe, to tame the ‘wild Irish’ of Donegal in 1611. Depending on local circumstances, the government supplemented these reforming, assimilationist policies with more coercive measures: namely expropriation and plantation. In his Basilikon Doron, James VI expressed the hope that the Isles would be tamed by planting ‘colonies among them of answerable inland subjects, that within short time may reform and civilise the best inclined among them: rooting out or transporting the barbarous and stubborn sort, and planting civility in their rooms’. Ultimately his plans came to nothing and local hostility to the venture frustrated three attempts (1595-1602, 1605, 1609) to settle the forfeited Isles of Lewis and Harris with adventurers from Fife. In Ireland demands for colonial enterprise and expropriation of native lands dated from the later Middle Ages. However only after the Desmond rebellion of the 1570s in Munster did wholesale plantation win widespread acceptance. Edmund Spenser, in A view of the Present State of Ireland (1596), called for the destruction of the existing Gaelic order and the systematic colonisation of Ireland with English settlers who were to be made responsible for the erection of the political, economic and social framework that was considered the necessary support of a civil life and the Protestant faith. Yet early attempts at plantation in Ireland failed. In Ulster efforts in 1571-72 by Sir Thomas Smith (in the Ards) and the Earl of Essex (in Clandeboye) to establish private military settlements, which would provide bulwarks against the de-stabilising influences exerted by the MacDonnells, ended in disaster. The plantation of Ulster in the seventeenth century has enjoyed a more lasting legacy. The unexpected flight of leading Irish lords to the continent (1607) and the revolt of Sir Cahir O’Dogherty (1608), enabled the state to confiscate vast tracts of Ulster (encompassing present day Counties Armagh, Tyrone, Fermanagh, Londonderry, Cavan and Donegal). James VI and I, who from the outset took a keen personal interest in the plantation, allocated land in relatively small parcels (ranging from 1,000 to 2,000 acres) to 100 Scottish and English ‘undertakers’ and around fifty ‘servitors’ (largely English army officers who had settled at the end of the war) in the hope that they would create a British type of rural society. In addition he set aside other acres to endow key ‘civilising’ institutions—the church, towns, schools, and Trinity College, Dublin; while he obliged the City of London to take on the entire county of Londonderry in an effort to bring capital and economic prosperity to a commercial backwater. Finally, in the hope of creating a vested interest in the settlement and of ‘civilising’ the native population, he allocated land to 300 ‘deserving’ Irishmen. Predictably the reality of the scheme didn’t match the king’s intentions and not only failed to generate sufficient cash but caused considerable discontent among the displaced native Irish population. Ironically the unofficial and unregulated plantation of the non-escheated counties of Down and Antrim proved to be much more successful. In 1605 Sir Hugh Montgomery, sixth Laird of Braidstone in Ayrshire, and another Scottish favourite of the king, James Hamilton, carved up the estates of Conn O’Neill, lord of Upper Clandeboye and the Great Ards, in a tripartite agreement with O’Neill and attracted a significant number of settlers—predominately Scottish—to the region. In County Antrim Randal MacDonnell, first (Gaelic, Catholic) Earl of Antrim, introduced many British, Protestant settlers to his vast patrimony and on numerous occasions the king thanked him for ‘his services in improving those barren and uncultivated parts of the country, and planting a colony there’. Randal would have been familiar with this concept because he had been fostered on the Scottish island of Arran (hence his name Randal Arranach) and thus exposed to James’s unsuccessful attempts to ‘plant’ the troublesome Highlands with Scottish Lowlanders. In fact one recent scholar has suggested that Randal formed an important human link between the Irish and Scottish plantations. By the late 1630s the Antrim estate boasted well over 300 ‘British’ (or Protestant) families. The town of Dunluce, for example, consisted ‘of many tenements, after the fashion of the Pale, peopled for the most part with Scotsmen’. These Scots—roughly 30,000 migrated to Ulster as a whole prior to 1641—brought with them their Presbyterianism and their distinctive political beliefs. Thus from the early seventeenth century the North Channel World expanded to include Protestant preachers, planters and profiteers who shuttled back and forth between Antrim and Ayrshire, forming a homogeneous unit which, like Catholic Gaeldom, was united by the sea rather than the land. By 1638 and the outbreak of the Bishops Wars in Scotland these migrants, who looked to Edinburgh and Glasgow for political and religious leadership, represented an even greater threat to national security than their Catholic neighbours. Lord Deputy Thomas Wentworth, quickly branded them as political subversives and forced them to take an oath of loyalty to the king (the infamous ‘black oath’). In retaliation to this and Wentworth’s other ‘thorough’ policies, the Scottish planters—led by an English Presbyterian from County Antrim, Sir John Clotworthy—allied themselves with the anti-Wentworth coalition in Ireland, the Scottish covenanters and Wentworth’s English opponents. Together they played a prominent role in bringing the lord deputy to trial—and to the scaffold—in London. The removal of Wentworth’s draconian hand in Ireland in turn facilitated the outbreak of rebellion in Ulster. The 1641 Ulster rebellion is one of the central military events in Irish history and played an important role in shaping the fate of the triple Stewart monarchy during the seventeenth century. It derived, on the one hand, from ‘long-term’ social, religious and economic causes and, on the other, from ‘short-term’ political factors which triggered the outbreak of violence. The plantation of Ulster combined with government attempts to replace the existing redistributive economic order with one centred on markets and the exchange of money had alienated many members of the Catholic population and resulted in widespread indebtedness. Political and military developments in Scotland and England offered the Irish an opportunity to rise in arms. To begin with, Charles I sought aid from Ireland—from the second Earl of Antrim during the First Bishops’ War and from Wentworth during the Second and thereby involved Ireland directly in his struggle with the Scottish covenanters. By rebelling themselves the Scots also offered the Irish a model for resistance against royal authority and, according to one pamphleteer, filled the Irish ‘with thoughts of emulation’. Above all the Scots created circumstances favourable for the fomenting of rebellion in Ulster. For as the royalist historian and statesman, Edward Hyde, Earl of Clarendon, perceptively noted in his History, if Scotland had not at that time rebelled, and in that manner, it is very probable all the miseries which afterwards befell the King and his dominions had been prevented. Whether ‘all the miseries which afterwards befell the king’ could have been prevented remains open to debate. Certainly the outbreak of rebellion in Ireland then triggered the onset of the First English Civil War and offered the covenanters, worried that a total Catholic Irish victory would provide the king with a ready ally against his recalcitrant Scottish subjects, an opportunity to meddle directly in Ireland. Thus within days of learning of the insurrection in Ireland the Scottish Parliament offered to send an army of 10,000 to Ulster to crush it on the grounds that ‘unless we do fully vindicate these malicious papists [in Ireland], these two kingdoms both Scotland and England, cannot sleep long in security’. The ‘Wars of the Three Kingdoms’ had begun. The Scottish troops dispatched to Ulster in 1642 included a regiment commanded by the Earl of Argyll. Argyll, determined to crush the MacDonnells of Antrim once and for all and to establish a territorial power base in Ireland, first occupied Rathlin Island (after murdering the inhabitants) and then seized the Earl of Antrim’s estates. Thus the onset of the Wars of the Three Kingdoms elevated what had previously been a North Channel World struggle into a major international conflict. Hatred of the House of Argyll underpinned the eagerness with which Antrim rallied to the king’s cause during the Bishops’ Wars; while a determination to prevent Clan Donald from re-asserting its authority in Scotland and a desire to establish himself in Ulster drove Argyll deep into the covenanting camp. Similarly, in June 1644 Antrim sent nearly 2,000 Irish veterans (under the command of Alasdair MacColla) to serve in Scotland under the royalist commander, the Marquis of Montrose, in the hope that he would not only rid his County Antrim estates of a Campbell army of occupation but would recover his patrimonial lands in the Western Isles. Hardly surprisingly, he and his kin hailed Montrose’s numerous successes on the battlefield (1644-5) as victories for the MacDonalds over the Campbells. One leading Gaelic poet, Iain Lom, commemorated the bloody rout of the ‘wrymouthed Campbells’ at Inverlochy (2 February 1645) as ‘a victory for Clan Donald’. These royalist successes also had an immediate and dramatic impact on developments in England and Montrose’s continued victories in the north prevented a third Scottish army of invasion from crossing the border to help the English parliament in is struggle against the king. The Campbell-MacDonald feud impacted again on national affairs when in June 1646 Antrim and his allies in the Western Isles not only refused to surrender at the end of the First English Civil War but, in conjunction with Scottish, Irish and English royalists, threatened to raise an army of 30,000 men which, after reducing Scotland, would march into England and free Charles I. Though it came to nothing, Antrim’s design seriously threatened any chance of securing a peace between the king and the English and Scottish Parliaments and it highlights the extent to which the vortex of the Wars of, for and in, the Three Kingdoms centred on the North Channel. Ultimately neither Argyll (who was executed in 1661) nor Antrim achieved their goals and attempts by Antrim to regain Kintyre after Argyll’s forfeiture fell flat. 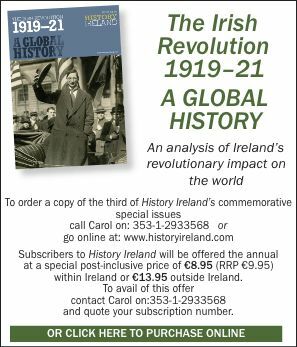 More seriously the civil wars of the 1640s, together with the reassertion of English control over Ireland and Scotland during the 1650s and continued economic change, marked a turning point in the political and military history of the North Channel World. The linguistic, religious, economic, and cultural linkages—both among the Protestant planters and the native Gaelic-speaking populations—remained very real and an unprecedented number of discontented Scots flooded into Ulster during the second half of the seventeenth century (60,000-100,000). But at least in the short-term the machinations of the North Channel World ceased to represent a threat to national security. The administrations in London, Dublin and Edinburgh had finally succeeded in driving a wedge within Gaeldom. In so doing they had, however, created problems the legacies of which the peoples—especially of Northern Ireland—continue to live with and try to reconcile. Jane Ohlmeyer lectures in history at the University of Aberdeen. J. Ohlmeyer, Civil War and Restoration in the Three Stuart Kingdoms. The Career of Randal MacDonnell, Marquis of Antrim, 1609-1683 (Cambridge 1993). G.A. Hayes-McCoy, Scots Mercenary Forces in Ireland, 1565-1603 (1996 Dublin). D. Stevenson, Scottish Covenanters and Irish Confederates: Scottish-Irish relations in the mid-seventeenth century (Belfast 1981). A. Macinnes, ‘Crown, Clan and Fine: the “civilising” of Scottish Gaeldom, 1587-1638’ in Northern Scotland vol. XIII (1993).